Description - Our Summer Rye Turf Rolls give you the look and feel of real grass without all the headaches that come with natural grass. Summer green all year long, this fake grass is the perfect alternative to natural grass anywhere in the country. Easy to clean and maintain, this artificial grass is UV stable, meaning it will not fade in direct sunlight. Made in the USA, our Summer Rye Turf Rolls are backed by a 10 year warranty. Face Weight – 60 oz. Weight – .62 Lbs. per square feet. Recommended Uses – Summer Rye Turf Rolls are the perfect natural grass alternative for any yard in the USA. 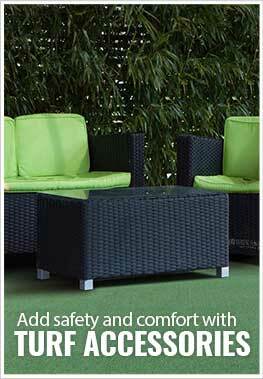 Easy to clean and maintain, these fake grass rolls can be installed indoors and out. Great natural grass alternative anywhere in the country.